Random station number 3 turns out to be the third least used station in London. Don't say I'm not taking you to all the best places. We're heading to West London's runtiest rail connection, the branch line between Greenford and West Ealing, which manages a half-hourly service during the day and shuts down completely on Sundays. It was slightly more useful when trains ran to Paddington, but Crossrail improvements have severed that, and now you can't even get to Ealing Broadway without a change. The line is an obvious candidate for Overgroundisation, apart from the fact that this would bring it to unnecessary prominence across the TfL network and basically, unless you live here, you don't care. 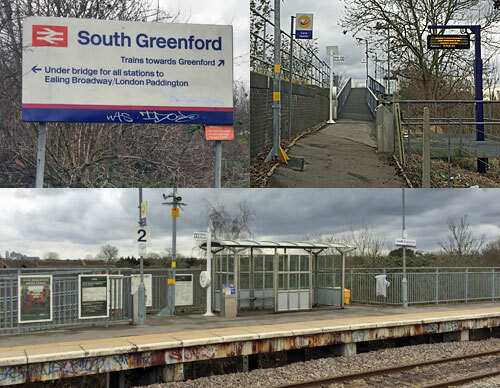 South Greenford station is a proper halt, essentially a couple of bleak platforms bunged in quarter of a century after the line originally opened. It's set on a viaduct, running high above the valley of the River Brent, which meanders out of sight to the south. Access is from the A40 Western Avenue, an unwelcoming spot brimming with particulates, and not ideal for the feeding in of potential passengers. New signs have been added at street level to indicate the line's recent cut back to West Ealing, but the main roadside signs still direct passengers towards stations that trains no longer stop at. On the positive side both platforms have step free access, so long as you can wheel yourself up a long tarmac ramp (currently lined with catkins and discarded bottles). 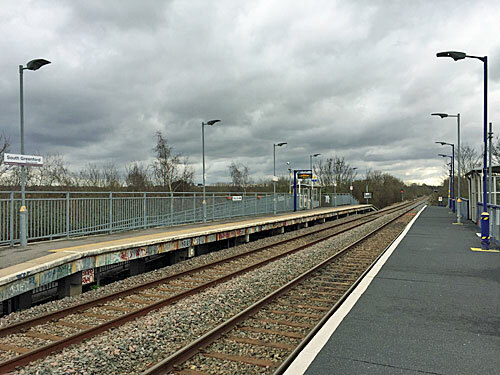 The southbound platform is the more substantial, remade from concrete rather than the original timbers opposite. Two Oyster readers have been installed, for the rush that almost never comes, plus a GWR network map in case you ever fancied a trip from here to Weston-Super-Mare. A couple of terracotta-effect planters have been added to the railings, long-since emptied, and a halo of spikes prevents anyone climbing to vandalise the loudspeakers and security cameras. Those waiting for their train can hide inside a shiny shelter, or gawp down the (very straight) tracks to see if anything is coming, or peer down through the trees (winter and early spring only) to the adjacent park and running track. On a Sunday it's a particularly forlorn spot, unless you have a sturdy thermos flask and a penchant for freight trains. On its platform signs South Greenford station is subtitled 'West Perivale', highlighting its somewhat liminal location. A swirl of Perivale's interwar avenues can be accessed via a subway underneath the A40, whereas vehicles can only get in or out through the shopping parade on the far side of the dual carriageway. 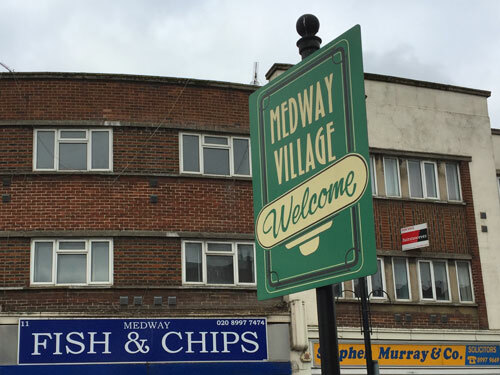 The Medway Parade on Medway Avenue features lots of shops called Medway Something (including Fish & Chips, Pharmacy and News), and has been jauntily rebranded Medway Village. 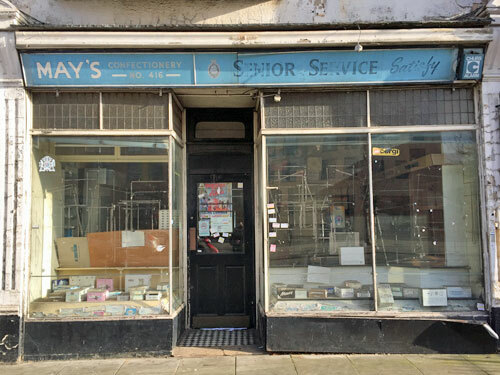 Its moment of glory came when it was used as a location in the final Doctor Who story of the 1980s, Survival, as were several of the seemingly peaceful backstreets. Today's residents no longer have evil alien cats to contend with, and those with any transport nous head round the back of the sports ground to use the Central line instead. The vast majority of South Greenford's catchment area lies to the southwest of the station, and includes the whole of the Broadway and adjacent shopping streets. Greenford Broadway is an excellent example of a major suburban parade, of late Metroland vintage, comprising two storeys of flats atop a long descending chain of retail units. Boots is one of a handful of survivors from 50 years ago, its painted logo still faintly visible high on a side wall, whereas the cinema-like building opposite has become an amalgam of bingo, slots and snooker. Hot food now makes up a substantial proportion of the Broadway's appeal, from kebabs to pierogi, and many's the schoolkid who nips here by bus at lunchtime for a boxed pizza. But what fascinated me most was an abandoned sweetshop by the main traffic lights - May's Confectionery. This time capsule closed around ten years ago, already a leftover from a bygone age, and has somehow survived intact into 2018. The window display consists of several empty chocolate multipacks, emblazoned with long-abandoned logos for Cadbury's Snack, Twix Xtra and Freddo Caramel. The Maltesers boxes have become almost entirely colourless after a decade of sunlit leaching. 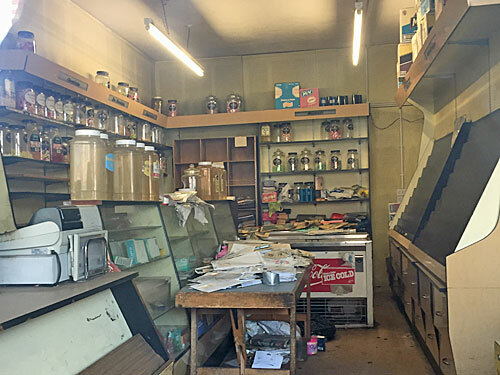 Peer through the sticky glass and the interior looks much as it must have done after Mr or Mrs May retired, with half-full jars of boiled sweets stacked up on the far shelves and a ride-on coin-operated lion stabled beneath the Lemon and Lime Ice Shake dispenser. Sure, all the greetings cards have disappeared, and there are a heck of a lot of unopened envelopes piled up on a trestle table, but I could still imagine being small and staring up wide-eyed at the treasures on the counter. It's hard to say what amazed me more - that May's has never been snapped up as a takeaway, or that the lights are still switched on inside. The London Motorcycle Museum: A marvellous collection of powered two-wheelers, racing memorabilia and the ARP sidecar from Dad's Army. I visited in 2008. "The whole place smells of garage, and petrolheads will feel immediately at home." Open Saturdays, Sundays and Mondays. 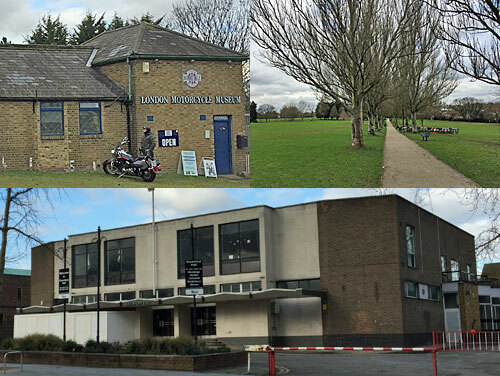 Greenford Hall: Scandi-influenced public hall, opened in 1966 by Dame Edith Evans, and recently refurbished. If you want to host a huge wedding reception with draped ribbons and candelabra, or throw an am-dram panto, get in touch. Perivale Park: Floodplain rec for football, cricket, bowls and golf, which you'll have yomped through on section 8 if you've ever walked the Capital Ring. Ravenor Park: Former farmland, now a park-on-a-hill, featuring a nature reserve, an avenue of white poplars and a rose garden. Litten Nature Reserve: One hectare of woodland, including three ponds, minibeast area and hireable classroom, watched over by conservation volunteers. They probably love it. The gate was firmly padlocked. 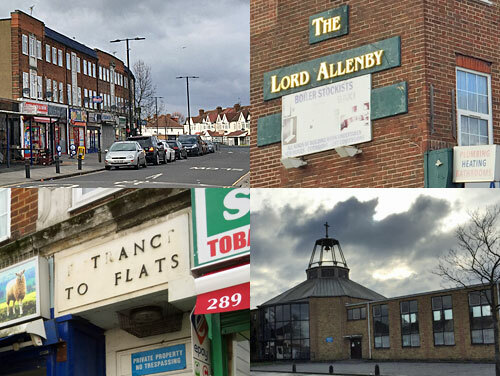 I walked to the farthest point of South Greenford's catchment, almost nudging into Southall - the curved parade on Allenby Road. Here were more shops than I thought a place with no name could ever need, bookended by a bathroom showroom that used to be a pub and the building where Ealing's learners check in for their driving test. The car park outside the Roman Catholic church is chained off, to be used only ten minutes before or after each examined circuit. The parade has no butchers as such, only the Rose Meat Shop which specialises in chicken and groceries. Round the bend cashiers watch over grandmothers picking through bowls of fruit, and an internet cafe lingers beside a gated staircase whose sign once said Entrance To Flats. In the surrounding streets immigrants from Eastern Europe and the subcontinent live side by side, and front porches contain signs saying A Yorkshire Terrier Lives Here, but in Polish. Here builders hurl chunks of bathroom into the back of a van, two lads in sweatshirts joyride down the pavement on a single saddle, and the mid-estate recreation ground is used by seagulls as a landing pad. The real London lurks far from the rail network, oblivious to pop-up cocktail deals, getting by.